I first read about Baby Led Weaning online. I was getting ready to wean Little Man, and doing my usual research before we got started. As I chatted with other mothers online and read articles on parenting sites, I kept seeing references to “BLW”. I had no idea what “BLW” stood for, so curiosity got the better of me, and I looked into it further. The more I learned, the more the idea of Baby Led Weaning intrigued me. A month or two before we were due to start weaning, I bought the Baby Led Weaning book to learn more about it, and everything it said just made so much sense to me. I thought the information about the development of a baby’s gag reflex was really interesting. The book explained that starting proper foods or finger foods earlier at around six months can actually be beneficial in teaching baby to control how much food is safe to put in his mouth while he still has a strong gag reflex to protect him from choking. I would advise anyone who is interested in it to look into it for themselves. If I had my time over, I would take a complete Baby-Led Weaning approach. I regret that, at the time, I didn’t have to confidence to do it. Looking back now, it’s obvious that Little Man took well to it. To this day, he prefers to feed himself. Now at 18 months, he’s very capable with a spoon and a fork – and if all else fails, he just uses his hands to get the food into his mouth. There are some great blogs online by people who have tried Baby-Led Weaning with their children. My favourite is Proper Fud – anyone considering following a BLW approach should read it. It’s a great resource for anyone wondering how to get started or what to expect from it. A few months ago, a Baby-Led Weaning Cookbook was released, with lots of ideas for suitable foods for breakfast, dinner, and tea. I use it regularly, even now. The recipes that it includes are suitable for everyone in the family, and I often use it for inspiration when we want to try something new for a family meal. When I first mentioned I was trying BLW, most people around me were very dismissive of it. It wasn’t something they had ever heard of. I tried to mention it to one of my local Public Health Nurses, and she just shook her head, warning me not to give any kind of finger food to a baby as young as six months because the baby’s gag reflex is still too close to the front of the mouth at that age. That’s exactly where the BLW book said it was though, but the book indicated that rather than making it easier for the baby to choke, the gag reflex would help baby learn not to choke himself. So I decided to say no more about it, and just try it out. I can’t say that the attitude of that one health nurse was typical, or just one person’s opinion because after that, I just didn’t mention it to any other health professionals. Once we started, and people could actually see how well such a young baby could cope with steamed vegetables or pieces of fruit, they became supportive very quickly. The second reason I went with some spoonfeeds was because I knew that eventually Little Man would be starting in a crèche, where he would be spoonfed. I didn’t want him to run into problems then if he wasn’t used to taking food from a spoon. So I just did some Baby-Led Weaning at breakfast, together with spoonfed yogurt or puréed fruit, or cereal. His main meal was a spoonfed meal at lunchtime, and then for tea, I went with a Baby-Led Weaning approach. At the start, I put a selection of fruits and vegetables, all steamed and cut into long sticks, in front of him. Later I added well cooked meat to this selection. For the first couple of weeks, we didn’t get very far! He mainly just played with the pieces of food. But after a while, more and more pieces started to make their way into his mouth. I can honestly say the evening meal was Little Man’s favourite meal of the day. And it was mine too. I never paid any attention to how much he ate at this meal, and it took so much stress out of meal time. One of the most difficult things to get used to with BLW is gagging. It’s inevitable. Sooner or later, baby is going to gag on a piece of food. For us, the first time it happened was with a chunk of carrot. Thankfully I had read about the difference between gagging and choking in the Baby-Led Weaning book, but it was still very difficult to sit there and let Little Man deal with the carrot himself. I just kept reminding myself “if he’s making noise and staying a healthy colour, he’s just gagging, not choking”. I was still on the edge of my seat ready to jump if it looked like he wouldn’t manage to free the food himself. But sure enough, it happened exactly like the book said it would. He worked that piece of carrot back to the front of his mouth and spat it out. Within a few weeks, we hardly had any incidents of gagging at all anymore. He had learned to manage his food really well. Without a doubt, the biggest pro of this style of weaning is that it is much more laid back than spoonfeeding. At least it was for me. To this day, getting Little Man to take food from a spoon is a battle most of the time, but put the food in front of him and let him choose what he wants to feed himself, and he’ll happily eat away. The other thing I really liked about Baby Led Weaning was how quickly we were able to introduce “real food”. These days, we find it easy to eat out without having to worry about whether or not there is a children’s menu. We know Little Man can eat almost anything we eat. In fact, if we hadn’t gone with this approach, I think I would have been hesitant to try him on such a wide variety of foods. I’d never have guessed how much he would like spicy foods! I always thought baby foods should be bland or creamy. But with BLW, if baby wants something from your plate, you let them taste it. That’s how we discovered that Little Man likes spicier food than I do! 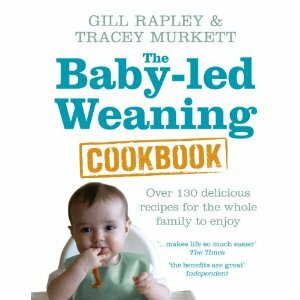 If you’re thinking about weaning your baby, or you’ve already started the weaning process and you’re feeling nervous about introducing finger foods or moving on from purées, check out the Baby Led Weaning Cookbook. If nothing else, it’s a great recipe book! Cutlery is great fun Tammy! Little Man loves stabbing things with his fork! Just read them Jill! More great foodie adventures for Dom! Great post Lisa, I sort of did the same with my little fella…some purees & more finger foods/blw type stuff. It’s so convenient isn’t it? Totally remember all the frights we got when he gagged but we got used to it. The grannies weren’t fans at all lol!